In one of the most amazing displays of great defense and poor shooting that you’ll ever see, No. 11/12 Virginia Tech beat No. 22/23 NC State 47-24 in Raleigh on Saturday afternoon. The Hokies improved to 18-3 overall and 7-2 in the ACC with the win, while the Wolfpack dropped to 16-6 and 4-5. No, that 47-24 score is not a misprint. Virginia Tech held NC State to 14 points in the first half, and actually improved in the second half by holding them to 10 points. The Wolfpack scored five points on their first two possessions of the second half, and managed just five more points in the remaining 18-plus minutes of the game. 1: NC State’s 24 points is the lowest total by a ranked team in the shot clock era. 2: Virginia Tech held an opponent under 25 points for the first time since a 105-24 win over Washington & Lee on January 9, 1959. 3: NC State was 9-of-54 (16.7%) from the field, which is an ACC record low, and the lowest in the history of the Wolfpack program. 4: NC State’s 24 points are the fewest scored by a Division I team in this decade. 5: NC State’s 24 points are their fewest in a game since beating Duke 12-10 in the 1968 ACC Tournament. That was the lowest-scoring game in ACC history. There are probably more numbers that will come out throughout the course of the day and into tomorrow, but you get the point. Saturday afternoon’s game was historical. Perhaps the most amazing stat of the game is the fact that NC State, one of the nation’s best offensive rebounding teams, pulled down 14 offensive rebounds and scored just two second chance points. Virginia Tech wasn’t particularly good offensively with Justin Robinson sidelined with an injury (he was in a walking boot on the bench) but it was good enough to nearly double up the Wolfpack. The Hokies were 16-of-45 (35.6%) from the field and 7-of-21 (33.3%) from three-point range. They missed their first five free throws, but made their final eight to go 8-of-13 (61.5%) from the charity stripe. Tech struggled with turnovers in the first half, coughing up the ball nine times in the first half against a team that is one of the nation’s best at forcing turnovers. However, miss after miss by the Wolfpack meant that they had very few opportunities to press past the halfcourt line, which is something that head coach Kevin Keatts likes to do. The Hokies turned the ball over just three times in the second half, and outrebounded NC State 42-36 for the game. Kerry Blackshear led the Hokies with 13 points and 13 rebounds. Nickeil Alexander-Walker added 11 points, and he also contributed five rebounds, three assists, three steals and two blocks. Wabissa Bede had nine points and four steals with just one turnover in 40 minutes, while Ahmed Hill chipped in with nine points. Freshman guard Isaiah Wilkins came off the bench to score five points and grab seven rebounds. Freshman guard Jonathan Kabongo played five minutes, but other than that the Hokies stuck with a six-man rotation against the Wolfpack’s nine-man rotation. NC State struggled to get the ball inside the three-point line against Tech, as have most teams this season, which helped keep VT out of foul trouble. 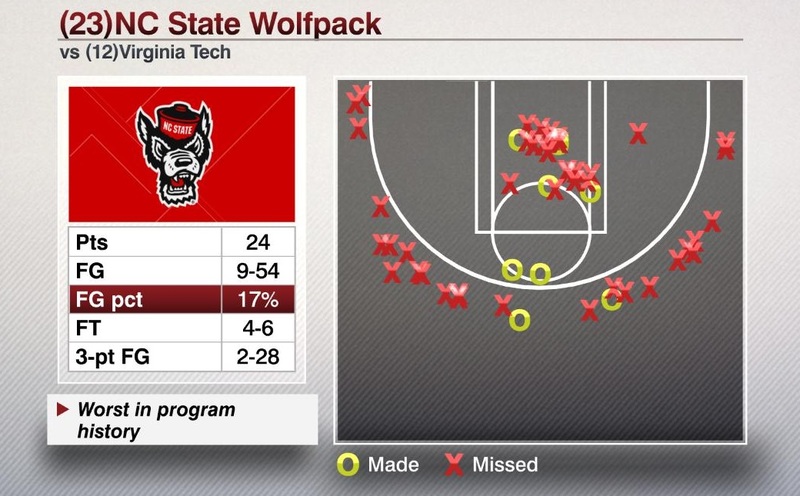 Here’s a look at NC State’s shot chart from Saturday’s game, per ESPN. As you can see, over half of their shots came from outside the three-point line. Virginia Tech led 20-14 at halftime, but an NC State offensive run was expected, as the Wolfpack averaged 88.4 points per game heading into Saturday’s contest. After scoring five quick points in the opening 1:25 of the half, it looked like that run was going to come early. However, it never came to fruition, as the home team managed just five points for the remainder of the game. After NC State’s quick run cut the lead to 22-19, the Hokies quickly answered, with Kerry Blackshear scoring seven straight points to push the lead to 29-19. The lead kept growing, as NC State did not make a field goal from the 18:35 mark of the second half to the 6:49 mark. All they managed in between was one free throw by CJ Bryce. As a result, the Hokies were able to gradually extend their lead and leave Raleigh with an easy, and historic, victory. The victory is Virginia Tech’s third Quadrant One win of the season, all of which have come on the road. The Hokies haven’t had an opportunity for a Quadrant One victory at home yet, but they’ll get that chance on Monday night when Louisville comes to town. The Cardinals currently rank No. 13 in the NET, and are also ranked No. 15 in the AP Poll and No. 16 in the Coaches Poll. Tipoff is scheduled for 7pm, and the game will be televised nationally by ESPN. If Five is out for 6 weeks we are in big trouble boys and girls. Horne is out indefinitely as well. I’m afraid Louisville is going to drop a big L on us tonight, just based on our lack of depth and our propensity to pick up bad fouls. Hope I’m wrong but Robinson is what make this team go and without him I’m afraid we lose some we shouldn’t. Get better young man! Possible that the injuries may have silver lining. Wilkins and Kabongo’s minutes now makes the team even better, pending Robinson’s and Horne’s return, come tournament time. Back to yesterday’s game. When you go on the road and win in the ACC it is special. These guys are fun to watch! On news tonight, reported Seth said Robertson out indefinitely. But where is Horne? Noon time start. Both squads looked like they had just woke up. Glad the Pack keep sleeping. Lucky win on the road, but we’ll take it. It’s such a crazy stat you look for reasons like that, maybe no one wanted to get out of bed with the cold spell? Seth Greenberg just stated on the ESPN halftime highlight show (4pm game) that J. Robinson is expected to be out for 6 weeks. Talked to J. Rob after the game. He stated that no X-rays had been taken as of yet (I asked him if he knew if it was a Jones’ fracture or a pseudo-Jones’). He stated that “Coach didn’t feel I’d be needed for this game.” Nice. Well, if they haven’t even bothered to take x-rays of his foot yet, then maybe it’s not too bad. Not sure I would believe that statement. No, They would x-ray right away – if a question, x-ray again in a week. Lots of reasons – from NCAA big time team, to liability, to coaches want to know. this makes no sense. why would they not x-ray to get a definitive answer one way or another? why would the coaches not need their floor general on the road? nc state is a ranked opponent…buzz williams actually thought about throwing this game?really?? Never gets old seeing “Virginia Tech Hammers….” in the headline. Love it! I am happy that we have an ACC road win. I am not sure that “hammers” is the correct characterization of this win. We need to do better at home Monday night. Really? I thought the Hokies came out sluggish against the Canes, woke up, and when they put effort in were quite good, but got too comfortable when ahead, and couldn’t stomp a bad Miami team. I wasn’t able to watch the game live, and when I checked the score on ESPN app, I truly thought it was some sort of misprint. I thought, how is 24 points even possible? I’ve now watched my DVR of the game, and saw how it was possible. Superb, high-energy defense, to be sure, but a bunch of missed open looks and blundered layups/putbacks by the Pack. Let’s hope Loserville cooperates this much on Monday night! Congrats to the Hokies for getting it done with essentially six men playing! Tremendous effort on D. Sure would be nice to hear an ETA on our two wounded warriors. Agree with you 100% DW. Really impressed with the defensive effort and how those kids played, but I’m still holding back some of my accolades. I’m trying to convince myself our defense frustrated them so much they were totally our of sync and couldn’t established any rhythm. But out of my pessimistic eye I saw a Wolfpack team that looked mostly incompetent. I mean 16% and 2 of 28 from outside the circle? You are right that a bunch of those threes were uncontested. Somehow I have trouble believing this same team almost beat UVA last week. The thing that really concerns me is how our offense looked without JRob. We also didn’t exactly resemble a well oiled machine, and give credit to them for that. Knowing our floor general was out they attacked the ball well. We need to find a lot more offense against UL Monday night, because 47 points won’t cut it. At least that’s what I gleaned from watching them against UNC today. But this old man will be there Monday night hoping for another stellar performance. Go Hokies! Very strange game today and it was if there was a cover on the basket 🙂 Road wins are wonderful however they happen! At the risk of jinxing the team, We’re on countdown to declaring success for Buzz Williams coaching at VT. He has taken a program that was seriously moribund and perhaps even worse, some sort of total irrelevance to college football, eg, down-the-hall coaches, picked over players and no fans to NCAA rankings, a record third straight NCCA bid and (gasp) sold out games. Who knows, talk might even get started on building a new basketball arena, the dynamics have changed that much. Still, need a good showing at the ACC and NCAA tournaments so fingers crossed, but i don’t think we have to hope against hope that might happen. That’s pretty positive for you so I’m encouraged! Has something changed? Pretty risky for me, I was going to wait til the season was over before making said statements, one simply being we got our money’s worth for Buzz. Declare him a success and a reminder to the football folks that it takes four years sometimes to watch the plan come together. I would still like to see that NCAA tournament win, even if we get a high seed and play Northwest South Dakota Teachers college in the first round. We haven’t done…that…yet…just get that win. On the brighter side, this has gotta help with recruits. I don’t know if Buzz is already getting the guys he want – he says he doesn’t expect to get McDonald All-Americans (which I suspect means he doesn’t want any MAAs if they’re only going to be there one year) so in Buzz’s world that might must mean slighly better recruits or maybe a NAW or two evey couple years, it’s gotta help but not – if I understand Buzz – in some “next level” kinda way. I love Casell coliseum, kinda reminds me of Hoosiers, the old school gym, but watching the team play at JPJ – as much as I hate it – that’s what’s going to attract top recruits. Again, maybe that’s part of Buzz, he doesn’t want that either, and he seems to do alright w/the guys he’s getting now. But anyway, the whole point is simply to declare success. Give me one win in the NCAA’s for completeness. Who knows what the future holds but it looks like – cross fingers – he’s done it. 2 wins. Tired of getting bounced in round of 32. I say at least final 4! Yeah, I’ll go with two wins. But kinda my point that Buzz has 0 wins in the NCAA at VT so kinda need a couple of those to make my point.